You’re outsourcing your Social Media Management. Have you thrown all that money away on a “Cat Herder” who’ll get you no Social Media ROI? A social media cat herder is all about getting you reach at any cost. Who doesn’t want reach, right? It’s the essence of brand awareness right? Cat herders are just looking for the next viral post. Often it’s a kitten holding a teddy bear or a meme about wine. They’ve got posts going out everywhere, getting shared by everyone; it’s social chaos wrapped in gorgeous big numbers. This is great right? So why have you got zero social media ROI? There’s no plan. There’s no strategy. It’s just about delivering you some numbers that look big and shiny. Cat herders are the WORST kind of social media managers. Here’s why. There’s an alarming trend in the social media marketing industry – cat herders are coming from everywhere. Brand owners who have failed in their own business now wish to run yours! They know the secrets of making posts go viral and wish to sell those secrets to you… the same secrets that caused their own businesses to go under. What does a viral social post actually mean? A viral post is actually just any of your content seen by people indirectly, via a share, retweet etc. Someone is sharing your content with their friends without your involvement. That’s the goal, right? Actually it’s not a goal, it’s a tactic – if done correctly, but it’s not a goal. Cat herders will tell you that your reach is phenomenal, that their work is valuable and that you should keep paying them to keep those “cats” in line. Need help? Talk to a strategist now. There is definitely value in getting your brand spread far and wide. At each stage of your social media development, getting some viral activity is key. Getting “empty followers’ based on their love of cats will, inevitably harm your social media activity. You’ll end up paying to reach them… there’s no ROI in that! It’s time to ditch the cats! Spreading a viral image of a cat near a swimming pool has zero real value in terms of ROI (unless you sell water safety courses to cats). Sending an infographic viral answers a problem that your key audience is experiencing – that’s valuable viral activity! It’s nowhere near as simple as a cat riding on a robot vacuum cleaner. Viral posts that re-enforce your brand value, that demonstrate to new viewers that you’re someone who can solve their problem – that’s the viral honeypot. If you are going to go for cats falling in swimming pools, the best practice is to send it viral and then edit the status update with a call to action explaining why the new audience should follow your brand. Do you have established relationships with my core market? If you’re targeting 25-44 year old mums with young children at home, the answer should be yes. If it’s Procurement Officers for mining fleets over 25 vehicles, it might not be so easy (but I’m sure there’s a social media manager out there for that too!) If the answer is no, the next question is, how are you going to build this network for me? The more network building needed, the higher your quote will be. Expect that! You’re entering my niche. What’s your plan? An established social media manager targeting your niche is ideal. You’ll hit the ground running and your costs will be lower than one having to build a new network. However, outsourcing to a social media manager who is already representing several names in your niche may actually open up other cans of worms. Be sure that your social media manager isn’t going to attack an established niche in “cat herder” mode – sharing viral images that have already made their way around your niche over and over again, is going to paint your brand as “tired”. How do you perceive my brand? This is the most important question that you can ask a new social media manager. The reply shouldn’t just be what you’ve put in the brief. It should be a critique of your current social media activity. It should be an honest opinion on your website and blog content. It should contain a plan for getting your brand’s values across consistently and clearly. Making sure that the social media manager understands exactly what you’re trying to say and has strategic ways to engage your audience about your brand. How do we measure the success of a post? If it’s all about retweets and favourites and shares… it’s the wrong answer. Cat herders are all about the easy numbers. Your social marketing plan should contain goals for growth, for engagement and click through for ROI. If there’s nothing about ROI, you’ve hired yourself a cat herder! Defining social media ROI might be “brand awareness” or it might be “sell sell sell” – your social media manager should be working towards your goals and be able to show real, concrete data on how they’re delivering. Should my (mining company) be on Instagram? If the answer is yes, the strategy is bad. When you outsource social media management, you should be given information on where your core demographic is hanging out. Even if the answer is Facebook, Twitter, Pinterest, Periscope, Snap Chat and Instagram, don’t pay for a new social media manager to get established on all those at once. Pick one and let her prove herself there, show that her strategy works and then let her loose on all the others. When a new social media manager comes on board, she’ll need to train your audience in the new approach. Once she’s established what works and what doesn’t, then let her tailor that to the other platforms. How many sales did your social media activity influence? If you’ve not set your Google Analytics up properly with either Commerce tracking or goal measurement, you’ll never know the truth! Are you using all the tools in the kit? Are you giving her unique URLs for tracking blogger outreach? Are you measuring your campaigns carefully? If you’re outsourcing to a cat herder, she won’t be using Google Analytics. She won’t be able to answer questions about ROI, assisted conversions or other vital areas of measurement. Both business and social media management companies make the same mistake: they assume Google Analytics is about measuring a website. 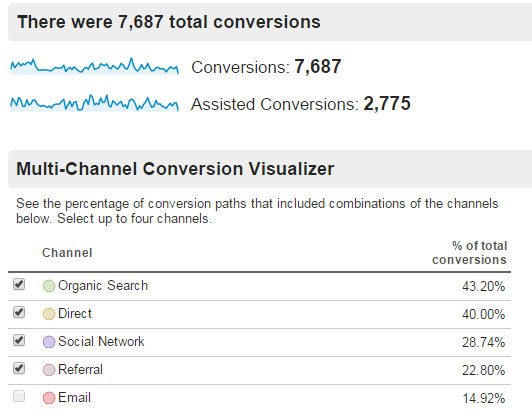 Google Analytics is about business growth, not website growth. It’s about interpreting data to establish a strategy for growing your whole business. Social media management is one of your core marketing activities and should be measured carefully. If your social media manager doesn’t know how to do that, chances are, she’s a cat herder. Understand that Google Analytics is about business growth and social media ROI is an essential part of that. So you’ve hired a cat herder? You may need to undo some damage. Empty follows, especially on Facebook, have a long term, detrimental effect on your business. Having followers who never engage, who will never buy from you and who actively hide your content means paying more to reach the right people. Just like you “sanitise” a mailing list, you’ll need to sanitise your social followers. To get started on a real social media strategy, talk to us now. Or to get social media training, check out our Social Media Training Brisbane.